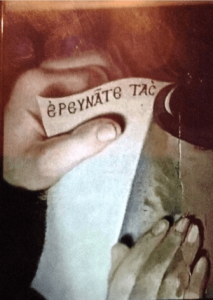 28 Oct Epeynate Tac – what does it mean? Rev Thomas Blackwell, whose portrait hangs in the main corridor at Trinity Hall in Aberdeen, was called to the Ministry as Presbyterian minister at Paisley, Renfrewshire, on 5 April 1693. His ordination was delayed until 28 August 1694 for various reasons, one being his own uncertainty about accepting the call. He moved to Aberdeen on 9 October 1700, and in 1710 he was elected Professor of Divinity at Marischal College. 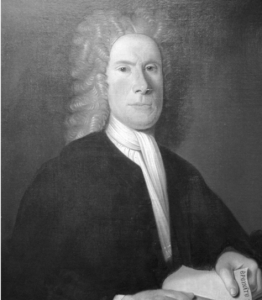 Rev Blackwell was elected fifth Patron of the Seven Incorporated Trades in 1716 remaining in post until his death. Note: Bourignonism was named after Antoinette Bourignon a French religious fanatic of the time. His portrait (above) shows him with a book open to a page where the words Epeynate Tac are shown. During a visit to Trinity Hall, Daisuke Matsunaga, Consul General of Japan noticed the words Epeynate Tac and asked what they meant and in what language. Initial enquiries proved difficult and using the English version of the words, I located a single reference in the book “The Fragments of Heracleon” by Heracleon the Gnostic in1891. 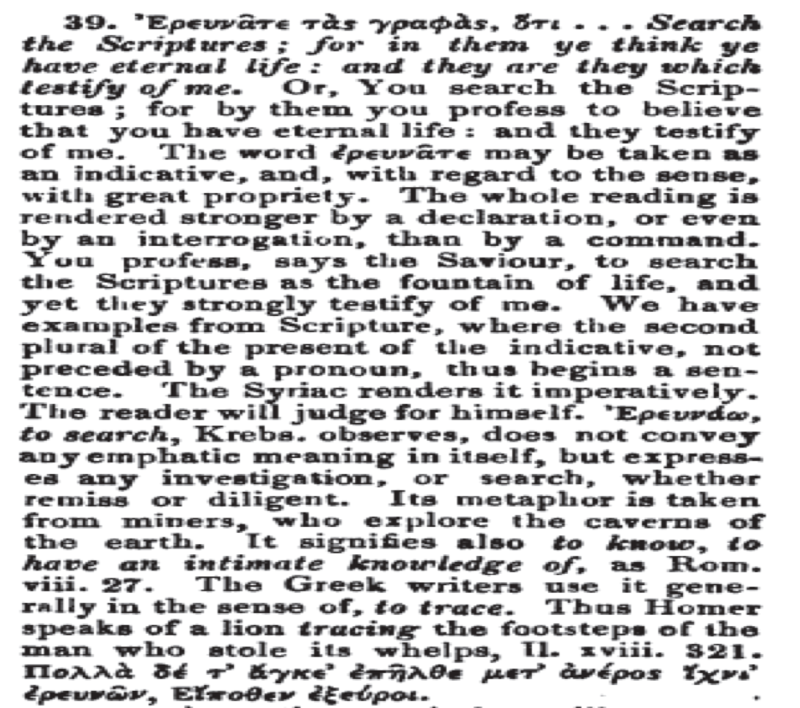 I was advised that the words are ancient Greek and after more research, using ancient Greek text, I found numerous references to the following – ερευνάτε τας γραφάς – which apparently means, investigating the Scriptures or examine the Scriptures or seek the Scriptures, but with no further explanations. It did, however, make sense with Rev. Blackwell being a Professor of Divinity. It may have been the simple message he wanted to get across for those who saw the portrait. On page 36 the reference is – “Search the Scriptures; for in them ye think ye have eternal life: and they are they which testify of me” See below for the full reference. Trinity Hall were delighted to welcome Mr Garry Cant from Queensland Australia for a tour with Ex Deacon Convener David Parkinson. Mr Cant is a distant descendant of the late Reverend Andrew Cant whose portrait hangs within Trinity Hall. Reverend Andrew Cant was the Rector of Kings College in 1651 and his son, also Andrew, and a Minister went on to become the principal of Edinburgh University. Mr Cant and his wife visited several sites of relevance to their family history on their trip to Aberdeen including Edinburgh University and St Nicholas Kirkyard where Reverend Andrew Cant is buried. On the 22nd August the InterTrade golf competition took place at Alford Golf club. On a summers day typical of 2018 a hard fought competition was won by a team from the Weavers Incorporation . Rennie Rushton from the Hammermen won the Littlejohn Trophy as the best individual followed by George Esson who won the Assessors Cup. The day was arrange by Ian Logan and thanks for all his efforts of the past years as Ian has intimated his wish to resign as golf convener. 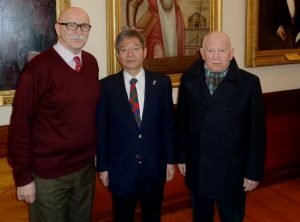 We were pleased to welcome to Trinity Hall the Consul General of Japan in Scotland, Mr Daisuke Matsunaga andmembers of the Order of the Scottish Samurai. Mr Matsunaga was appointed to his current post in May 2016 following a distinguished career in the Japanese Ministry of Foreign Affairs. His previous roles were Director for the Climate Change Division in the Ministry of Foreign Affairs and while in that post, also served as His Majesty the Emperor’s official English interpreter for two years. The 2017 golf outing was held at Alford Golf Club on Wednesday 16th August. An excellent turnout of twenty-seven members and five guests, including our Patron Rev. Iain Thomson, enjoyed the delights of Alford Golf Course on a mainly dry afternoon. As usual, the course was in excellent condition. After the keenly contested golf, we partook of an excellent two-course supper pleasantly served in the relaxing and friendly atmosphere of the Clubhouse. While a fiftieth birthday has a large significance in the short live of individuals, this is less so in the life of an organisation 430 years old. It remains nevertheless well worth marking. Our present Trinity Hall celebrated the fiftieth anniversary of its official opening ceremony on Saturday 28th October 2017, the official opening itself having been also on a Saturday, 28th October 1967. To mark this noteworthy event we enjoyed a small series of events. On Friday 22nd September our own Clerk and Assessor, Craig Pike, along with wife Sophie, mother Eileen, and friends Amanda Massie and Alastair Corbett, treated us to a wonderful and varied concert of music popular in the 1960’s. Our sincere thanks to them for a great evening. On the morning of Wednesday 23rd August 2017, Aberdeen Bakers Incorporation member Gregory Russell was admitted as burgesses of Trade at the start of the full council meeting at Aberdeen Towns House. He were proposed for membership by Deacon Convener George Esson. 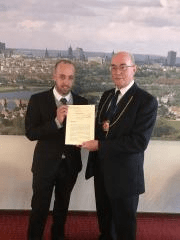 Having met the requirements for admission and undertaking to pay the necessary dues to the Lord Provost they then accepted the responsibilities incumbent by law as a true and faithful of a City Burgess of the city of Aberdeen. Deacon Convener George Esson pictured with Gregory Russell.